Sunday January 31 at the Irish Club Hotel, Toowoomba – from 2pm to 5pm. We are excited to report that the “Strummers” monthly concerts will return on Sunday January 31 at the Irish Club Hotel, Toowoomba – from 2pm to 5pm. “The Delphics” … combining the ethereal vocals of songwriter Sally Harris with the drive of multi-instrumentalists Don Jarmey and Sam Krauser, The Delphics deliver traditional tunes-based balladry with a tight-paced intensity, creating songs that are in turn foot-stompingly rhythmic and sweetly transcendent. From pirates and petticoats to beggars and booze-bolters, The Delphics conjure echoes of the past in a timeless, melodic style. 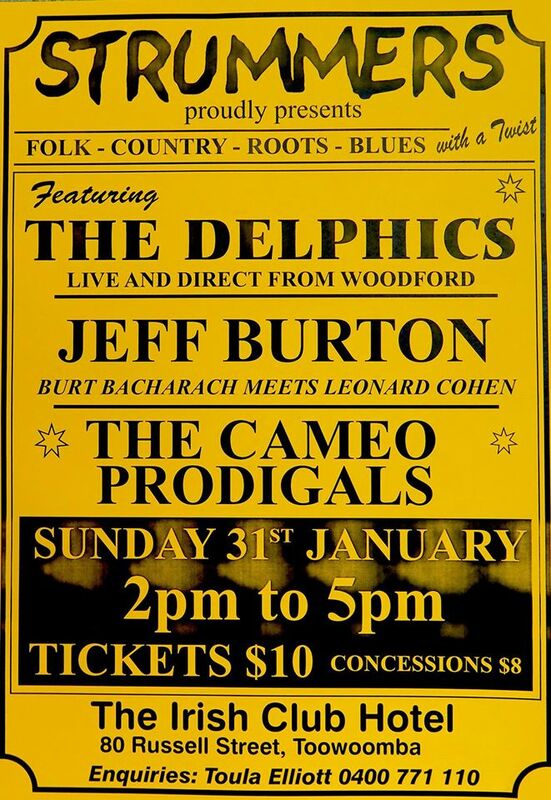 Fresh from their exciting, standout shows at the recent Woodford Folk Festival, The Delphics are primed and ready to entrance the ears and hearts of Toowoomba with their unique charms. “Jeff Burton” is a highly accomplished songwriter, singer and multi-instrumentalist with a large international online following. Definitely different to the norm, think Burt Bacharach meets Leonard Cohen. Definitely tasty and captivating. “The Cameo Prodigals” features a few of the rascals from the old “Strummers” getting together to “launch the ship” again – John Holmberg, Alan Mackey, Ryk Rostron and Helen Rowe will bring guitars, mandolins, fiddles and yes a banjo to create a little dose of mischief and mayhem … come join the fun !!! Good meals are available at the Irish Club from 12pm till 2pm and Sunday special drinks prices include pints (Guinness etc) $6 & spirits $6. We hope you can come along to help support LIVE MUSIC in Toowoomba !!! Don’t miss “Strummers Returns” at the Irish Club Hotel, 80 Russell St, Toowoomba on Sunday, 31st January 2016 from 2pm to 5pm.